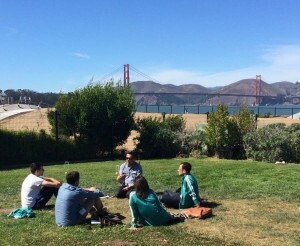 We hosted out first Maven Ventures Hypergrowth Retreat on September 23rd. The goal for our inaugural Retreat was simple: we wanted to do something different from all the other conferences in the Valley. We wanted to host the kind of conference that people found meaningful and enjoyable, where attendees left with new connections and practical advice to immediately impact their business. 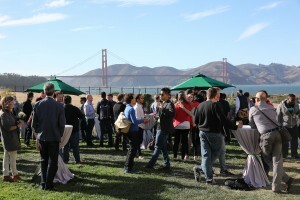 With a purposefully intimate number of attendees, the special Presidio location, and the quality food and hosted bar, people had a truly enjoyable day doing something great for their startups. And, a little luck with an incredibly beautiful SF day and this view sure helped. There was a special energy in the room among hard-working and smart people who wanted to help each other — it truly felt like a retreat. With only 125 seats, attendance was limited. But with so many great speakers, we wanted to take this opportunity to share a summary of the talks and some of our key takeaways. If this sounds interesting to you, we hope that you will consider joining us at our next Hypergrowth Retreat. The day started with a conversation around product-market fit, then moved into growth analytics and unlocking new channels. 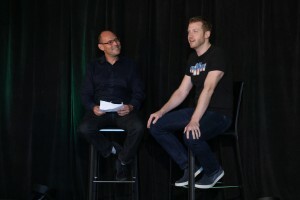 Speakers covered engagement, running high performing product teams, and getting a top-tier Series A done. We closed the program with the story of a phenomenal exit. To join us on the journey of product launch to billion-dollar acquisition, read some of the wisdom from the top growth experts below. In a conversation discussing product market fit, Elliot Shmukler, Darius Contractor, Annie Chang, and Dan Barak helped attendees determine when to focus on product vs. growth. Building a company is like building a fire, they said. Don’t overload a fire with too many logs until you have a strong ember — in other words, don’t focus on acquiring tons of new members until you’ve established an engaged audience. Head of Google’s Search Analytics, Ken Rudin explained that growth is a game of inches: many small wins — such as adding a button or omitting one word in a call to action — add up to outsized user engagement returns. For example, adding a voice search button was hugely successful for Google mobile search in Asia where typing on a smartphone keyboard is very cumbersome. 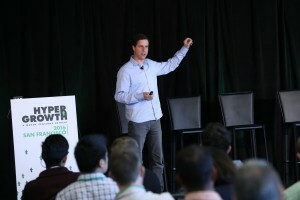 Growth channel experts Brian Balfour, Andrew Chen, and Sam Lau said that each growth channel can be exhausted, and every Head of Growth should have many channels in the pipeline. Iterating between growth channels is just as important as iterating your product. For example, non-traditional tech advertising “old-school” channels have been making a comeback: Slack and Uber have both been experimenting with TV ads and our portfolio company Zoom with billboards. Nir Eyal taught us that the tech companies that win don’t just build the best product but capture monopoly of the mind. He shared how that can be done with the hooked model and creating appreciating value with greater usage. Uber’s engineering director Akash Garg encouraged product teams to focus on speed and stability when shipping product. He suggests feature flagging all changes or new features in your code, especially for large changes seen by the end user, in case of bugs or negative impacts on usage. Series A investors Aaron Batalion, Alfred Lin, and Rebecca Kaden offered these pieces of advice to founders in fundraising mode: be honest and forthright about issues your company faces to build trust with investors; be patient and build a relationship with investors over time, but if you feel like you are getting strung along, politely ask what it will take to get the deal done. Kyle Vogt encouraged entrepreneurs to build businesses that excite them personally — in his case large potential scale, technically challenging, and beneficial to society. Kyle advised against letting large incumbents (Google, Uber) daunt a founder away from a passion, and against party rounds of uninvolved investors. Beyond the formal sessions, speakers also joined attendees for curated lunch roundtables. There was significant networking time with both the experts and attendees, and from the feedback we received, the first Hypergrowth Retreat was a homerun. These insights just scratch the surface of what was discussed at the retreat…hope to see you in person next year!